10 Responses to "0.16 Tournament Results". I would like to see some adjustment. The recent quality of life changes are great for the player but they are objectively making the game easier. 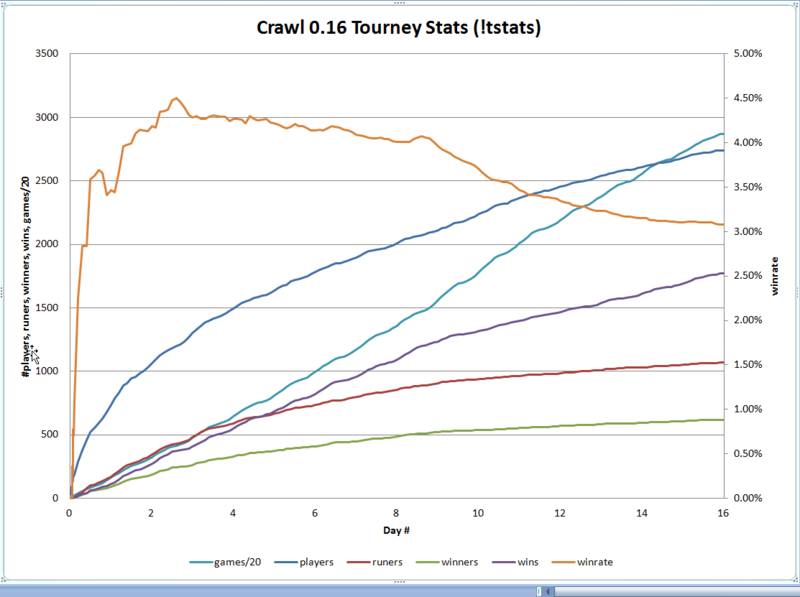 this player obviously botting allday with 30k+ games played, do you count it into the statistic? Agree with 1#. Recent changes make the game simpler and easy to beat. Don’t feel it’s the DCSS i met 5 years ago, a completely hard game. Don’t agree with the above. Making the game more playable does not mean it is easier. If deaths are reduced that were caused by a missing “do you really want to?” this does not mean it is easier. Bad UI != challenge. I’d also like to add that a game with a 2% winrate can’t really be called anything BUT “completely hard”. I concur with #3. I won’t believe that the game has become “easier” overall just by looking at blanket win %, which can hinge on a number of factors.. such as more players being willing to dig deeper into the game now that it is more streamlined. I would much prefer a dialogue over specific changes to the game that some think need to be reverted or adjusted due to making the game too easy. hungeyneko: We filter out bots from the statistics. Good question! Higher win rates are to be expected as regular players get better at the game and the generally improved understanding of it percolates to newer players. Higher win rates may also be the result of a higher concentration of good players. In high jump, and most other sports, the bar (literally and figuratively) has been being pushed higher & farther. I don’t see why DCSS should be any different, as more and more players become long-term players, and information/strategies is/are more readily available. Also, 2.03% is not exactly indicative of an easy game, but it could mean that recent updates have helped to whittle down on total-luck deaths, eg: “You fell down a shaft two levels!” from D1 to D3, and are suddenly surrounded by 3 uniques with no means of escape.